I love Nanking Cherries. They are big bushes that grow little bitty cherries right along the stems. My dad had one in our front yard. It produced a couple of gallons of cherries every summer and we loved to them into jelly. 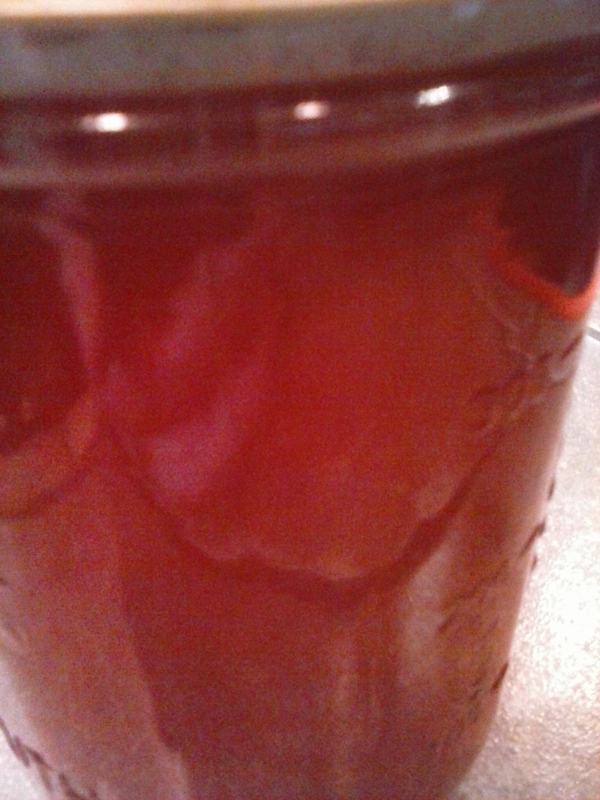 Sweet but tart and such a pretty shade of red. My friend has several enormous bushes. She was generous enough to share with me. I picked a couple of gallons of cherries and we barely touched one bush. I really wanted to get more but my life got crazy busy. If you are lucky enough to have Nanking Cherries, try this jelly. It's pretty easy to make, although it can be tricky to get to set up. If it doesn't set up, it makes wonderful pancake syrup. You could probably get similar results from pie cherries, those bright red, almost clear looking tart cherries. They are larger, but the taste is similar. Wash the cherries and pick out any leaves, stems, or bad ones. Discard those. Place the rest of the cherries in a large saucepan. Add the water. Cover and bring to a boil. Remove from the heat and let it sit for about 30 minutes. Stir the cherries to help release the juice. Mash them around if needed. You want to squeeze all the juice from them so turn that pot of stuff into a pulpy mess. Strain the pulpy mess through a cheesecloth lined colander. Go ahead and squeeze it if needed. You want all the juice you can get but not the pulp or the pits. Measure your juice. You need 4 c. for this recipe. If you are short, add water to make up the difference. If you have too much, add the extra to some cold apple juice and enjoy apple-cherry juice. Measure the sugar and set it aside. Prepare your jars. You need 3-4 pint jars for this recipe. Starting with clean jars, place them in a sink full of the hottest water you can get from your tap. Let them soak while you cook the jelly. This heats up the glass and reduces the chance of a jar breaking while you are filling it. Add the sugar all at once. Cook and stir until it comes to a complete boil, like before. Boil and stir for one minute. Remove from the heat. 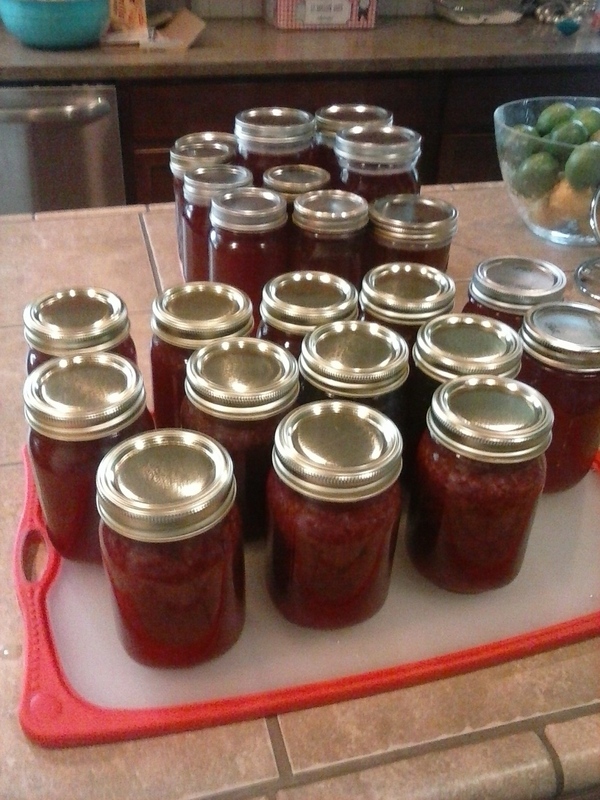 Carefully pour or ladle hot jelly into the prepared jars. Wipe the tops clean and add lids and rings. If you process the jars to seal them, the jelly will last for several years (unless it all gets eaten which is highly likely). Process them in a boiling water bath for 10-20 minutes, depending on jar size and your altitude. This is a great link for how to process jars, this one gives the basics on how to figure out your processing time based on your recipe. I live close to sea level now and I was using pint jars, so I processed them for 10-12 minutes and got a pretty good seal. Before, I was at 5500 feet so I processed my pints for 18-20 minutes. Whatever you do, be safe and follow the recommended directions for your canner and area. If you just put the jelly in bottles in the fridge, it will last for about a month. So eat it up or give it away. It's good stuff.